The Olympus 9-18mm lens is a versatile way to explore ultra-wide angle shooting. It does a great job of allowing you to capture an entire scene. This lens really puts you inside the action. For dedicated street photography in real-world situations, the Olympus 9-18mm does really well. If you’ve moved into micro four thirds from DSLRs with ultra-wide lenses then this lens is going to help you settle in and feel at home. The real reason to add this to your kit is that you probably already have the 17mm prime that came with your PEN or the 14mm that came with your GF Panasonic. Your second cab off the rank was the excellent 20mm Lumix. But somehow all of this has left you without a wide angle as good as an LX5’s 24mm or your trusty 24mm SLR lens. The 9-18mm Olympus is your ticket out of wide angle withdrawals. The quality of the images is great. Good contrast and detail across the aperture ranges. It’s not as bright as your primes so you’ll occasionally need to up your ISO a little. Amin from Serious Compacts did some in depth testing of the lens. If you’re interested in the technical ins and outs of the lens then check his review out. It suffers a little from the “what’s the point of this image” problem that some wide angle lenses have. But it’s saved by being nice and contrasty so that you can still make out the story that’s being told. It’s variable focal length allows you to cheat on the zoom with your feet by reacting fast to a situation. You’ll often find yourself on the street, maybe in a crowd, and all of a sudden you want to grab the context or the size of the crowd but can’t step back fast enough or far enough. With this lens you can drop back from a nice normal 17mm (35mm equivalent in 35mm) to the 9mm (18mm equivalent) and grab an ultra-wide shot. Powerful stuff. Even with the hood, the small size means that your micro four thirds still looks subtle. You can snap quite good closeups without pointing the camera directly at someone. It’s a dark colour and it is seriously compact. Even the way that it extends is subtle. Class. To decide whether this lens is for you the best thing is to try it out and see which ends of the zoom you are using. 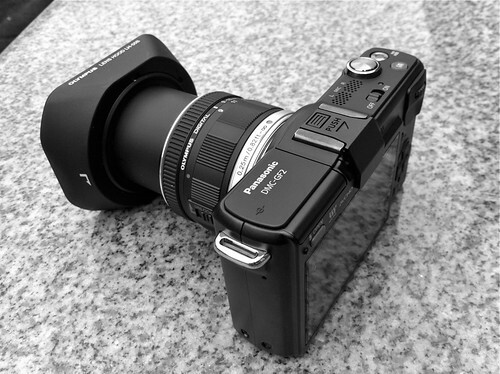 If you’re sticking to 9mm – 12mm then this lens or the new Olympus 12mm are for you. If you’re sticking to the 18mm end of the lens then you might be better sticking with the primes. You can check out the Flickr album of my time with the lens on my Peter Thomson photostream. Hi, would you recommend this lens for shooting interior design (wide angle and high DOF (everywhere sharp) necessary) and action sports photography in restricted light conditions (deep forest, etc.) ?? Or is there some better tip at similar price? Thanks for advice!! For interiors, yes. For sports (high shutter, wide aperture), not so much. Alternatives would be the Panasonic 14mm or the Olympus 12mm but for an ultra-wide the 9-18mm is excellent.